Sunset Cliffs Park is eroding at an unbelievable rate. 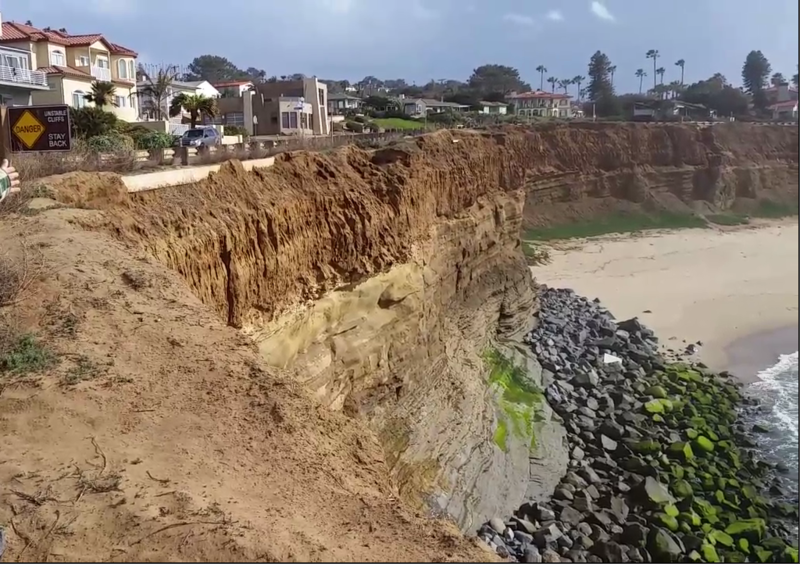 At this point, the erosion in Sunset Cliffs Park is at an emergency status. In the next couple of years the erosion at Sunset Cliffs will reach crisis levels, and very similar to the coastlines in other Southern California coastal locations. Many Southern California coastal locations are experiencing catastrophic home and coastal useable land loss. Sunset Cliffs park is at emergency land loss status and Sunset Cliffs Boulevard is in serious jeopardy of being lost if the current rate of erosion isn't addressed immediately. If the erosion isn't addressed immediately there will be serious crisis conditions with the coastal parkland and boulevard loss along with crisis status of home and life loss along Sunset Cliffs. The Current need for a new "Comprehensive Storm Drain System" could not be underestimated. "Top-Down Erosion" and "Slope Erosion: Top-down Block Erosion is caused by the cliff edge becoming saturated with water and then the weight of the excess water creating a collapsing the cliff in large block sections. The Top-down Slope Erosion is caused by water running down the hillside to the cliffs edge during rainstorms and creating cut out gullies of erosion that continue to cause the cliff edge to recede and undermine the boulevard. Top Down Block Erosion and Top Down Slope Erosion at Sunset Cliffs. At Sunset Cliffs Park erosion is happening in the locations were the streets that come down the hillside of Point Loma, intersect Sunset Cliffs Boulevard. The erosion is being caused by the inability for the current storm drain (which is only the curb), to control the velocity and the volume of the rainwater runoff. The rain/storm water runoff that Sunset Cliffs park experiences is at a much larger volume and velocity than the current system can control. The result is water flowing uncontrolled to the cliffs edge where it is saturating the Cliffs and causing the catastrophic "Top-Down Block Erosion" that we have been experiencing at Sunset Cliffs for decades. Again The Urgent need for a new "Comprehensive Storm Drain System" could not be underestimated.